Today’s lunch box suits both adults and kids as well. Dal Paratha and pineapple yogurt raita on the side, a heavenly combo. LUNCH – Dal Paratha – Dal paratha is a very popular in Rajasthani and Gujarati ,dish prepared with whole wheat flour, dal and spices. It can be prepared with any dal.I have used toor dal to prepare this paratha. 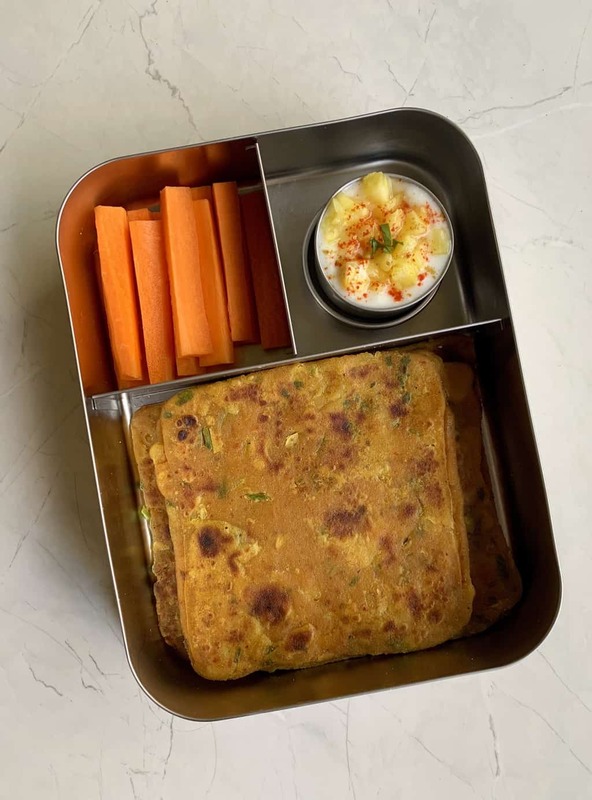 This is a very healthy, filling and nutritious breakfast or lunch item.You can use leftover dal for this recipe.But i prefer cooking fresh dal for kids lunch box. Divide the dough into 6 equal portions.Roll it to make slightly thick paratha.You can roll parathas to any desired shape.i made it square shape. Heat the tawa until hot enough,Transfer a paratha to the tawa. When the paratha begins to get bubbles over it. Flip it to the other side and cook until golden spots appear. Smear little ghee. Press gently for the paratha to puff. Serve dal paratha with raita,plain yogurt ,chutney or any curry. Square Paratha is made into a square shape by first rolling a circle, applying ghee and then folding it over 4 times to make a square before rolling it out one more time. 1.You can use any dals like moong dal or channa dal.I prefer using toor dal. 2.You can add finely chopped onions too but i dint add to this recipe. 3.You can add freshly chopped spinach or methi (fenugreek) leaves to the paratha. SNACK – Pineapple Raita Combine plain yogurt , jeera(cumin) powder, chat masala powder , salt, pepper in a cup. Mix well and then add the minced or chopped pineapple on top, pack this in a separate container with leak proof lid.Can use frozen or canned .I used fresh pineapple here.You can simply replace pineapple with any veggies of your choice. SNACK – Carrot Sticks Wash and peel the carrots.Cut them into 2 inch long sticks and then pack into the box. You can prepare dal paratha in the night itself and slightly warm in the morning before packing,If you don’t prefer that then make the dal dough the night before and refrigerate. Make the parathas in the morning and pack. Chop the pineapple into small chunks and refrigerate. For the soft chapati, it is important to cover the dough and set aside for at least 15-20 minutes. With the above measure you can get 4 parathas of regular size and 6 small size. Adding a few teaspoon of milk to yogurt raita can help it not turning sour by lunch time.